IDS and Sussex alumna Sosan Aziz has been shortlisted for a prestigious British Council Alumni Award in Pakistan’s Social Impact Category. The Award recognises the outstanding achievements of alumni with a UK higher education whose work has positively changed their society or community. Sosan completed her Master degree in Gender and Development at IDS in the University of Sussex in 2008. On returning to her home country of Pakistan Sosan joined the Aga Khan Foundation's Education Project where her work focused on involving women in School Management Committees and Mother Support Groups to help motivate communities to improve the education of their children. There she made a substantial contribution to improving girls’ access to education. 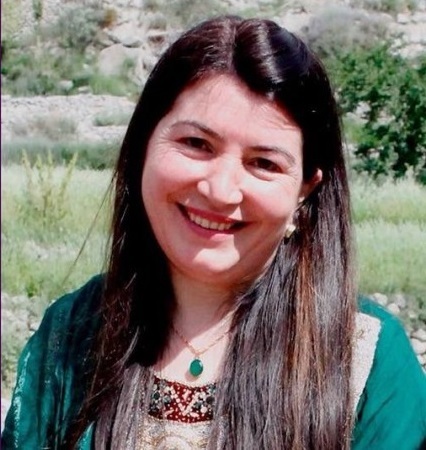 Sosan’s work with her local community to increase girls’ enrolment in education in Gilgit-Baltistan led to the establishment of many new local level education institutions, and benefitted girls in over 100 schools in the region. Two years later, Sosan joined the Aga Khan Foundation’s Health Project where she led a major capacity building initiative - involving over 1200 community midwives, female health workers, female health visitors - that has contributed to improved maternal and child health outcomes in Gilgit Baltistan’s five districts. During that time, Sosan also worked as Gender and Social Development Specialist in the Aga Khan Rural Support Programme’s Gems and Jewellery Development Project. There she raised awareness of women’s participation and worked to eliminate discrimination against women and other vulnerable groups working in the gems and jewellery sector. As a result of her awareness raising and capacity building activities a large number of women and girls from Gilgit Baltistan became involved in the sector at cottage-industry or small-businesses level. Sosan is currently employed at the Economic Transformation Initiative in Gilgit Baltistan which is funded by the International Fund for Agricultural Development and the Government of Pakistan. She leads their work on gender, poverty and youth’s involvement in infrastructure development and agriculture value chains. Alongside her formal employment Sosan is active in a number of community-based services. Since 1995 Sosan has volunteered as the Pakistan Coordinator of the Himalayan Grassroots Women’s Natural Resource Management Association; in 2007 she became Chair of the Board of Directors for ‘The Mountain School, Gilgit’ and since 2015 Sosan has been a member of the National Aga Khan Youth and Sports Board for Pakistan playing her role for the development of youth and children with a zeal. She believes that studying in the UK has given her a major advantage professionally, and encourages other young people, especially women, to pursue higher education as a means to achieve economic empowerment and social change. This is the second consecutive year that an IDS alum has been shortlisted for the Awards. In 2017, alum Bolaji Abdullahi’s work on educational reforms in Nigeria saw him selected as a finalist in the Nigeria awards programme. The winners will be announced at the Awards Ceremony to be held at the British Deputy High Commission Residence on 20 March 2018. We are proud of the contribution that studying with IDS and the University of Sussex has made to enabling Sosan to achieve such remarkable impacts, and we wish her the very best of luck at the Awards ceremony.